Credit Suisse slashes its 2019 year-end S&P 500 price target to 2,925 from 3,350. "Our lower price target reflects recent volatility, rather than a change in fundamental backdrop," an analyst says. The S&P 500 has fallen 12 percent in the last three months. Recent wild rides in the stock market have forced Credit Suisse to cut its forecast for 2019. The bank has slashed its 2019 year-end S&P 500 price target to 2,925 from 3,350. The new target would be a 15 percent gain from current levels. "Our lower price target reflects recent volatility, rather than a change in fundamental backdrop. Since late September, volatility has more than doubled, driving stock prices down 13 percent," Jonathan Golub, Credit Suisse's chief U.S. equity strategist, said in a note to clients on Tuesday. The stock market has tumbled in recent months on recession fears and the trade tensions between the U.S. and China. 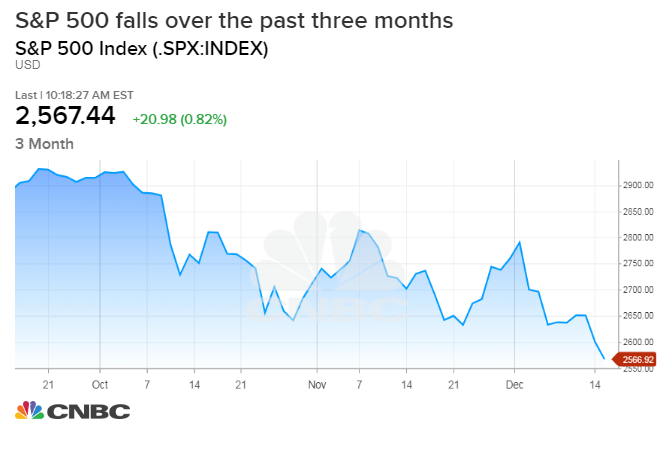 The S&P 500 fell 2 percent on Monday to its lowest close for 2018, bringing the three-month losses to 12 percent. On Tuesday, the S&P finished just above the previous session's close. The Cboe Volatility Index — one of Wall Street's gauges of market fear — hit a nine-month high in October and since has been hovering around 25. While cutting the stocks' price target, Credit Suisse kept the earnings per share estimates for 2019 and 2020 unchanged at $174 and $185, representing 6.7 percent and 6.3 percent gains, respectively. Revenue is expected to increase 6 percent in 2019, the bank said. This year's economic growth has been driven by tax changes and government stimulus, and 2019 will likely see "a deceleration toward more sustainable trend levels of 2.5 percent GDP," Golub said. "Importantly, with recession risks well-contained, such a backdrop should be more than sufficient to propel the market forward." Looking ahead, he anticipates that in three to five months the Cboe Volatility Index will drop below 15. Plus, he thinks the Federal Reserve is going to say it is done raising interest rates and there will be "an OK but good enough earnings backdrop," he told "Fast Money" on Tuesday. All that should lead to a double-digit return by the end of next year, he added.